The Vancouver Condo Buzz » West Abbotsford Hartwell Townhomes in Westerleigh Community from $229,900! Grand Opening at the Hartwell Abbotsford Westerleigh Polygon Development ON NOW! « OWN in KITS from <$300k! Introducing the Boutique KitsWest Vancouver Westside Condos in the Kitsilano Real Estate District > Affordable Vancouver Kits West Condominiums > REGISTER NOW! Located in the West Abbotsford real estate district, the Hartwell Westerleigh townhome community is a new Polygon developmetn featuring affordable two and three bedroom homes. Affordable pricing starts from the low $200’s (latest update is $229,900) and this limited/exclusive collection of Arts & Crafts style Abbotsford Hartwell Townhomes in Westerleigh will feature amazing stonework, masonry and wood shingle accents. The architecture is definitely Arts & Crafts with a modern twist and the new Hartwell at Westerleigh Abbotsford townhomes will feature private decks for outdoor entertainment and relaxation space in addition to attached garages which are very convenient. Just minutes away from urban amenities as well as local conveniences, educational facilities and outdoor recreation, the new Abbotsford Hartwell Townhomes at Westerleigh community will start sales in Spring 2012. 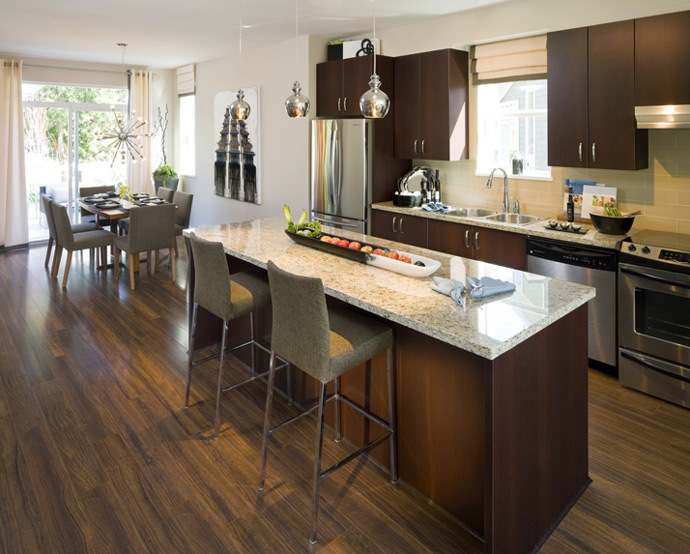 The Hartwell Abbotsford townhomes are built and designed by Polygon Homes, a notable and award winning developer in the Lower Mainland/Fraser Valley. The Hartwell Townhomes in Abbotsford will also feature open play floorplans as well as gourmet kitchens that are finished with high-end countertops, cabinetry, stainless steel appliances and laminate wood floors. When it comes to this master planned Westerleigh Abbotsford community, the new residents at Hartwell Townhomes will be able to enjoy the close to 10,000 square foot amenity space which is called Club West at Westerleigh Abbotsford, where homebuyers will gain membership to this exclusive club upon closing. Here at Club West Westerleigh, townhouse owners will be able to enjoy a hockey room, movie theatre, a fireside lounge/clubhouse social lounge space, fitness gym as well as an outdoor pool. Again, the new Hartwell Abbotsford townhomes are located in the West Abbotsford Westerleigh community and the 2 and 3 bedroom homes will start from the low $200’s. You can visit http://www.polyhomes.com/community/hartwell_townhomes_abbotsford for more information or simply type in www.polygonhomes.com to see other upcoming projects by Polygon Homes. If you are a single, couple or family looking for multi-level living that is as close to single family detached living as possible without the maintenance, then the new Westerleigh Abbotsford Hartwell Townhouse community by Polygon Homes should certainly be on your list to see. Situated just between Langley and Chilliwack and between the border to the United States and the mighty Fraser River, the West Abbotsford community of Westerleigh welcomes the new Hartwell Abbotsford townhouses. As BC’s fifth largest city, Abbotsford real estate is on the uptick with many people moving into the region for it’s liveable communities and job growth. Here, residents at the West Abbotsford Hartwell Townhouses will be able to enjoy everything from the lakes and rivers to the mountain and valleys when it comes to outdoor recreation. When it comes to shopping, dining and other community amenities, the Westerleigh Abbotsford Hartwell townhouse project is within a short drive away to High Street with over six hundred thousand square feet of commercial and retail space as well as many big box retailers, boutique stores and fine/casual dining options. For home owners at the presale Westerleigh Hartwell Abbotsford townhouses who need to commute to downtown Vancouver for work or play, the West Coast Express is just minutes away as is the Abbotsford International Airport which is adding many new flight paths to its offerings. The new Polygon Hartwell Townhouses in West Abbotsford real estate market will certainly offer the best of both worlds: affordable urban living with a refreshingly country feel with natural beauty surrounding you versus living in a concrete jungle (in a studio). Also, recreational options and outdoor pursuits are just seconds away. Here at the presale Abbotsford Hartwell townhouses by Polygon Homes, owners can enjoy the Discovery Trail or Mill Lake as well as plenty of urban parks and greenspaces that make up your backyard. There are lots of golf courses as well as the Indoor Golf Centre where you can practise year round. Here are some of the standard features at the new Abbotsford townhouses at Hartwell at Westerleigh by Polygon. Most of the homes will enjoy outdoor living spaces with generous patios and fenced backyards that are great for people with pets and children. In addition, you can expect to find luxurious granite counters and full height imported tiled ceramic backsplashes in the kitchen. The main living level will have 9 foot ceilings while the lower and upper floors will have eight foot ceiling heights (all considered overheight). Also, the new Abbotsford Townhomes at Hartwell at Westerleigh community will feature large windows with decorative window shelves. The ensuite bathrooms will have full length vanity mirrors, marble tiled accents, low flow toilets, two vanity sinks and a spacious walk in shower with glass door. The Arts & Crafts architecture at the Westerleigh Abbotsford Hartwell by Polygon townhomes is designed by Robert Ciccozzi Architecture Inc and the detailed craftsmanship is seen through the stone work, gables and shingles that create a unique and pleasing façade. The Hartwell Abbotsford community will also feature a professionally designed and landscaped courtyard. Two and three bedroom Polygon townhouses start from the low $200’s. Greetings from Hartwell, Polygon’s newest collection of affordable townhomes in the landmark master-planned community of Westerleigh in West Abbotsford real estate market. As a registrant for this exciting new Hartwell Abbotsford townhome community, we are pleased to let you know that we will begin our sales program in March 2012 with new Abbotsford Hartwell homes priced from just $229,900! With the provincial government’s recent announcement introducing a first time homebuyer tax credit worth $10,000 on purchases of newly built homes, now is a great time to get into a new home! 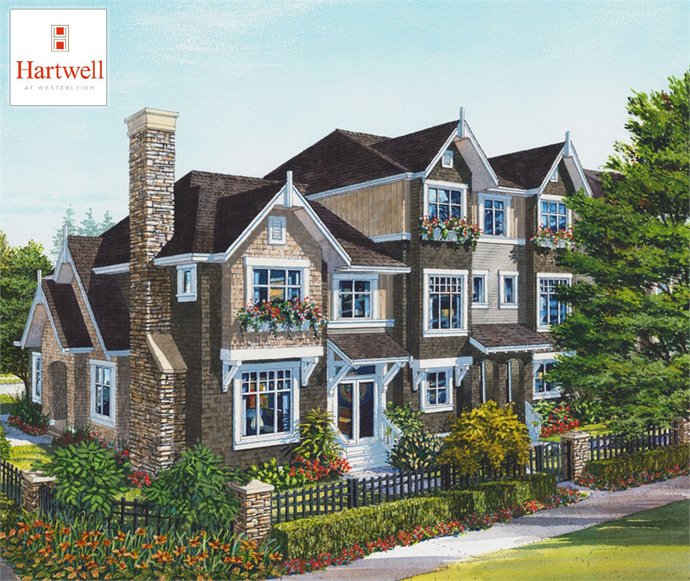 Hartwell at Westerleigh Abbotsford real estate development features a limited collection of two and three bedroom townhome residences showcasing welcoming Arts & Crafts-style architecture with distinctive stonework and wood shingles. 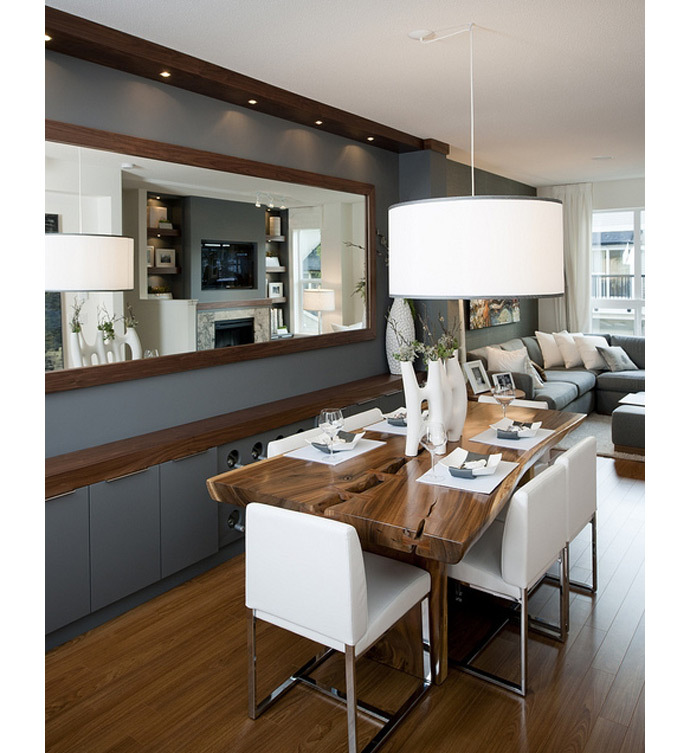 Contemporary interiors feature efficient open plan layouts and designer finishes. For added convenience, private decks invite outdoor living and attached garages welcome residents of every Westerleigh Abbotsford Hartwell home. Located in the growing West Abbotsford real estate neighbourhood, Hartwell at Westerleigh townhomes is minutes away from education, recreation, and urban amenities. And, every Hartwell Abbotsford townhome resident can take advantage of membership to Club West, Westerleigh’s future resort-inspired private clubhouse with outdoor pool, fitness studio, fireside lounge, hockey room, theatre and much more. New Abbotsford Town Homes from $229,900: OPEN MARCH 10th! With Hartwell Abbotsford town homes starting at just $229,900 giving you mortgage payments starting from $829 a month*, and with the provincial government’s recent announcement of a new homebuyer credit worth $10,000, now is the time to get into a new home at Hartwell Townhouses. The three stunning display homes designed by Polygon’s award winning Interior Design team at the Hartwell Abbotsford Town Home community will showcase open-plan layouts and gourmet kitchens with granite countertops and stainless steel appliances. And as a reminder, all Hartwell Abbotsford home owners will benefit from membership to the future Club West at Westleigh – an impressive residents-only clubhouse with resort-style amenities including an outdoor pool & whirlpool spa, a fitness centre, a theatre room, a mom & tot lounge, guest suites for out-of-town visitors and more.